If someone were to have lived in a cave for the past five decades and have no knowledge of popular culture, or if, perhaps for some unknown reason, a person was magically ignorant of all the interesting things that people do with sound waves (whether or not they know it’s called “music”), then they might find themselves in a position where a friend, distant cousin or trusted barber might say “I see Fairport Convention have a new box-set out” and their reply would be a terse “Who?”. 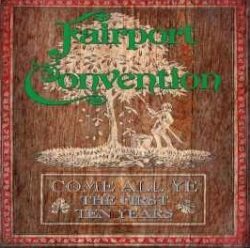 Fairport Convention are fifty years old. Just let that sink in. They, as a band have been in existence for half a century and, as this latest release proves, people are still keen to listen to their epic contribution to British Folk and music in general. An impressive feat indeed, though the joke from Trigger in Only Fools and Horses about his old sweeping brush springs to mind (“It’s only had 17 new heads and 14 new handles in its time…”) as a quick look at their various incarnations shows a band that has a higher staff turnover than a branch of McDonalds. On the flip side, they have managed to launch more solo careers and esteemed musicians than surely any other band in existence. So what does a new box-set tell us that 50 years of new releases, live shows and extensive forays into other bands and musical projects doesn’t? Quite a bit it turns out. Starting in 1968 and spanning ten years – a convenient number that is slightly arbitrary in terms of their career – Come All Ye provides a treasure trove for true fans and a wide-ranging and tasty sampler for relative newcomers. Presenting a bounteous mixture of unreleased material, live performances (including on John Peel’s Top Gear show – he was a real champion to their cause in the early years), album tracks and more live performances, aficionados will find plenty to keep their nerd-glands pumping pleasantly. Some of it is available elsewhere but not all by any means, and the sheer extent of the live performances is enough to warrant a listen for fans as well as make it thoroughly essential for the completist. They are an exciting band live with heavy doses of the traditional, challenged with the electric influence for which they became known, meaning the weighting of this release towards live material is not unwelcome. Newcomers to the band, on the other hand, will very likely experience one of those “where have you been all my life moments?”, such is the quality of those performances. They should be warned though that this is a rabbit hole of discovery and a casual listen will not do this band justice. Then, once said newcomer has done with this box set and the band’s back-catalogue, it will be time to look at the careers of Sandy Denny, Richard Thompson, Jethro Tull et al and marvel once again at one band’s ability to influence decades of British Folk Music.